"I would love to see a public square with a park, benches and trees; a peaceful place to gather and read books, and a great place for sight see-ers as well." "It absolutely mystifies me to think someone could prefer the square the way it is. I have been to the square in the evening three times in the last few months. It is grim and desolate. Cities seldom get an opportunity like this to create a new heart. The conditions are near perfect." ".. the biggest hurdle is fiscal but the project is an investment that will pay off through a higher quality of life ... making the community more liveable and walkable..... The challenge we've had for many years is that we've put traffic and cars ahead of culture and quality of life." Join us in the Square at 11am for festivities and ribbon cutting! Stratford Festival opens Treasure Island at the Avon Theatre. As of May 7th, the Slow Food Market will have an outdoor downtown location along the south end of Wellington Street, in the block between Red Rabbit and Soup Surreal. The Market will then shift to ... drumroll ... Market Square! What's to be done with Market Square? This website contains a treasure trove of information about the community process that delivered Stratford’s new public square. It includes various design concepts, media coverage, photographs and personal testimonials about Stratford Market Square. Thanks to the Stratford Perth Museum, this website has been archived on the Museum’s site so these valuable documents and memories will not be lost or forgotten. As of February, 2018, content on the site will no longer be updated, and external links may stop working, but take a roam through these web pages. The story of Stratford’s Market Square has its twists and turns, lots of history and a marvellous ending. Stratford’s Market Square sits exactly where the early settlers of Perth County wanted it – at the crossroads of the major roads within the Huron Tract. There are so many reasons to proceed with a revitalized Market Square and plans are well underway to deliver a people-friendly public square by the summer of 2017! It’s our heritage. 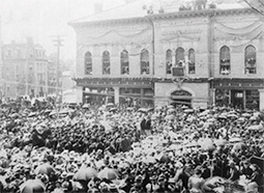 City hall and the historic storefront facades were purpose-built to frame a dynamic public and commercial space. It’s good for business. Other nearby communities that invested in their squares can attest to that. Best practices from other communities tell us that this project will deliver significant economic, cultural, environmental and social benefits to our community. The City's current plan are based on a decade’s worth of consultation and a competitive selection process that identified GSP Group as the winning design firm. A final design should be ready by summer 2016 . Significant government and private sector funds are ready to go. Infrastructure repairs under Market Square are urgently needed. We can celebrate Canada’s 150th birthday there in 2017! Market Square is the heart of our city. Plans and funding are in place to make it the beautiful, green, people-friendly business core that it is meant to be. Parking and transit can and will remain on or near Market Square. Check out the Market Square newsletter for regular updates about new developments in the Square. Click here: ABOUT THE SQUARE. The newsletter is posted in the Blog section of this website. Learn about the success of other nearby communities and their market squares in this powerful video that demonstrates the many benefits flowing from smart investments in downtowns and city centres. The City of Stratford is thoroughly engaged in a process to deliver a revitalized Market Square in time for Canada’s sesquicentennial celebrations in 2017. Scroll down to the “What’s New” section just below artist's image for the latest developments. Council accepted the recommendation from the selection Committee and has confirmed that the CIty will move forward with GSP Design Group. There are still many issues to be resolved -- parking and transit being two -- and there will be time for more public input. But the plan to revitalize Market Square is underway. We thank Council and the many highly engaged citizens who paved the way. Click on the link below for news coverage of the decision. Click on this link for details on scoring system and process to choose winning design. City Council heard once again from the group recommending the development of the area in front of City Hall last night. It was interesting to hear them make many of the same arguments for a pedestrian friendly city centre and public space that have consistently been a part of proposals for Market Square. Council took no decisions after these presentations. The Stratford Market Square Committee can only assume that the selection committee charged with assessing the three design concepts for Market Square -- the area behind City hall -- will continue its work and bring a recommendation regarding a preferred firm to Council by the end of the month. At last night's Council meeting local business representatives presented their serious concerns about accessible parking and transit. All three design proposals reflect that requirement, but the City needs to definitely identify some clear and doable options and soon. Both the Transit study and the ongoing Parking Study should give them the information they need as Phase One of Market Square development commences. Here are the links to the Parking and Transit Studies. 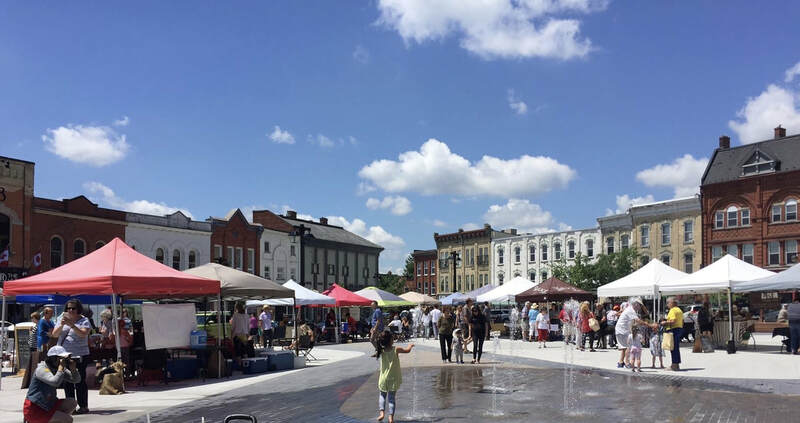 As you know, the Stratford Market Square Committee has consistently encouraged Council and the local business community to work together to find long-term solutions for Stratford’s Market Square. After over a decade of study and consultations, community support has galvanized around the idea that this space, bounded by historic storefronts and Stratford’s magnificent City Hall, can and should drive Stratford’s future economic, cultural and social growth. And the evidence is in. Elsewhere in Canada, and around the world, traditional market squares have revitalized the business and community health of countless cities and towns. We are hopeful that Council’s determination and vision, as expressed in your motion of July 27, 2015, and the solicitation of three proposals for design concepts for the square, means we are well on the way to seeing change at the heart of our community. Our Committee has reviewed the three design proposals submitted by GSP Group, MMM Group, and Janet Rosenberg and Studio. Given that each firm clearly has the competence and team capacity to conduct this work, our Committee has decided not to favour one proposal over another. Instead, we would like to list for you the elements or features of the design concepts that we think are important. Visual aesthetics: Our Committee supports the strong visual delineation of the space through decorative pavers that stretch the borders of the square from storefront to storefront. And we are pleased by the many references to the historic nature and beauty of the square’s building facades. We also encourage Council to ensure that the winning bidder takes steps to recognize Stratford’s unique history (agricultural and railway), current status as a centre for the arts and theatre, and future potential as a technology hub, in their design. Whether in Phase One, or Phase Two, we hope that the front of City Hall can be included in the overall plan so that aesthetic, and perhaps traffic, enhancements can be made there as well. We would also like to stress the importance of tasteful, but useful, directional signage. Parking and Transit: We fully support the maintenance of parking on both Downie and Wellington, and parking and service vehicle access along the southside of the square. As City plans for parking and transit evolve, we expect that both transit and more parking will be accessible very near the square. Amenities: Our Committee is on record in calling for more plantings, trees, seating, outdoor restaurant activity, appropriate lighting features (especially in adherence with a dark night standard) and public washrooms that make the square green, people- and bike-friendly, and safe. Safe pedestrian crossings are particularly important. We were impressed with various recommendations related to maintaining healthy plants, permeable paving, and drainage. Our Committee supports all efforts to ensure that the square is as accessible as possible for those with mobility issues (e.g., removal of hard curbs). Consultations with other local communities remind us that the square will also need reliable power and water supplies, integrated into the infrastructure, to serve large public gatherings and performance staging. All season use: While the development of a water feature and the potential for a removable skating surface will likely require some form of corporate sponsorship in Phase Two of the redevelopment plan, our Committee endorses the notion that Market Square can be a flexible and actively programmed space throughout the year. We are equally interested in seeing the City manage the implementation phase of this important redevelopment with a commitment to effective communication with city residents and the businesses that will be affected during and after the construction phase. Stratford Market Square Committee members remain available to support the successful implementation of this project behind City Hall. We believe we can play a role in future fundraising activities in support of specific Market Square features, as well as being a key liaison with the Stratford community. Stratford’s traditional Market Square is where our community first gathered to meet socially, share agricultural products and establish their enterprises. Market Square sits exactly at the intersections of the roads cut through the wilderness by the Canada Company as it pushed Huron Tract development and settlement west, toward Lake Huron. We look forward to Canada Day, 2017, when the Stratford community will gather to celebrate Canada’s 150th birthday in a refreshed and welcoming public space at the heart of the city. We eagerly anticipate Council proceeding with a final design firm selection on Tuesday, March 29th, as per the schedule, so implementation with this goal in mind can commence quickly. The City of Stratford has selected three finalists to present preliminary design concepts for a revitalized Stratford Market Square this spring. The goal is to introduce some strong visuals and design elements that will help consolidate a future vision for our city centre. Council and Stratford residents will have a chance to view the designs and provide their comments too. They are all highly-qualified firms with experience with similar projects. Perhaps we can stop talking and starting planning for our new and improved Market Square! The public is invited to attend an Open House session – prior to the regular Council meeting -- at City Hall in order to view initial design submissions from the three selected firms. Citizens are invited to drop in between these hours to view the proposed designs, provide feedback, and ask questions of the architectural design teams. The short-listed firms were instructed to use the guiding principles recommended to Council by AtFocus last July. These principles reflect the public consultations AtFocus conducted in our community. These images will go a long way toward consolidating a vision for our historic Market Square. We also expect that these designs will show how some parking can remain on the Square. Good design should give Stratford an attractive, people friendly space suitable for public events and programs, along with needed services such as parking and washrooms. ​We encourage you to participate at this time. Who knows, we might see shovels in the ground later this summer or fall! May 14, 2015 As Stratford City Council is poised to decide on the future of our valued and historic Market Square, the Stratford Market Square Committee would like to share some important evidence from other local communities about the impact an effective redevelopment can have. Waterloo, Brantford and Guelph have all pursued large-scale revitalization projects in their city centres that have delivered lively, people-friendly spaces that are supported by their citizens and local business communities. We hope you enjoy this #MyMarketSquare video https://www.youtube.com/watch?v=YnFnf1ATdO8 and consider its message - a strong vision for Stratford's Market Square will deliver many economic, social and cultural benefits to this community. Share the video on Facebook and Twitter, keep the conversation going. Here is a link to the Press Release that was circulated to media today. And click on the link below to see the list of downtown business owners who signed the Letter to Council, 43 signatures from 36 businesses. The Architectural Conservancy of Ontario (Stratford-Perth) welcomes Andrew Jeanes from the Ministry of Tourism, Culture and Sport, as part of Heritage Week celebrations. Come out to the Queen's Inn at 7:30 p.m. to learn more about heritage redevelopment across Ontario. Long-time resident Gordon Steed has been announced as Stratford Market Square Honorary Chair. His family's business, Steed Standard Transport dates back to 1939 and is now in its fourth generation of family ownership. The Steed family are exemplary in giving back to their community across many sectors. The City of Stratford has awarded a contract to a Toronto firm, AtFocus, to conduct a community consultation related to the future of Market Square. At present, the Market Square Committee has not been informed about the scope or timing of these consultations.